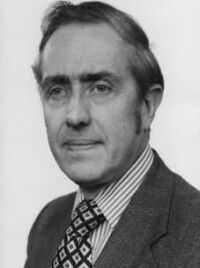 Evelyn Ebsworth read Chemistry at King’s College, Cambridge from 1951 to 1954, After graduating with a first, he completed a PhD, and was then elected to a Junior Research Fellowship at King’s from 1957-9, spending the latter year as a Research Associate at Princeton. In 1959 he was appointed a Fellow of Christ’s, and two years later he became Senior Treasurer of Cambridge University Liberal Club. In 1967, he left Cambridge to become the first Crum Brown Professor of Chemistry at Edinburgh University, a post he held for 23 years, later becoming Dean of the Science Faculty, 1985-9. He moved to Durham University in 1990 to become Vice-Chancellor and Warden for 8 years. He retired to Cambridge in the late 1990s, where he remained until his death.